Advanced accessible menu system for Joomla! DJ-MegaMenu is an advanced accessible menu system (WCAG 2.0 / Section 508 / ADA) for Joomla! 3 and Joomla 4 (alpha) that allows you to set each menu item as you want. You can set the number of columns per each menu item, as well as put the modules inside. The module gives you a wide range of possibilities to set up the menu you need. It’s also designed with mobile in mind so you’ll find many handy features. With intuitive workflow and included plugin for menu items you can easily manage and add different things to your menu. Decide how many columns, what modules, icons and effects will be used in any items of your menu. DJ-MegaMenu is fully accessible by keys on your keyboard (follows Web Content Accessibility Guidelines (WCAG 2.0) ). You can enable or disable support for keyboard navigation with arrow keys. Choose the orientation of the menu and display your mega menu where you need it. With DJ-MegaMenu you can display a couple of menus on one page! It's up to your needs and imagination. Each instance of the module can be styled the way you want! Add your logo to sticky menu and place it in center, right or left. With color customizer create unlimited variations of the menu for every module instance. Fit it to your design! With color customizer there’s no need to edit any files or know CSS but it’s also easily customizable with CSS. PS. you can also use one of 2 built-in default themes. Choose your menu effects (you can use one of the 30 possible) for entrance, exit. Select the speed and delay time of closing the menu. 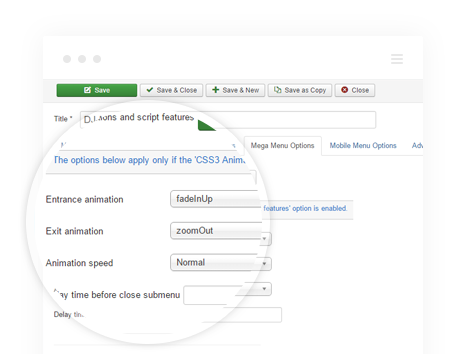 DJ-MegaMenu lets you use CSS3 animations, decide the dropdown direction and make menu items open on click or hover! DJ-MegaMenu is not only fully responsive it also has a touch interface which gives brilliant way to navigate through your site for the users using different mobile OSes. Choose when the menu should change to mobile view. With DJ-MegaMenu mobile options you can choose one of two predefined mobile themes (dark or light) and use color customizer decide how mobile menu should be displayed (off canvas, select list, accordion) and what logo should it have. 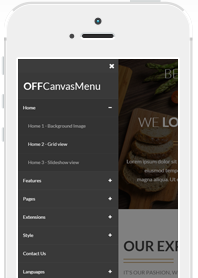 Off canvas mobile menu options come with 5 standard and 9 experimental effects. You can put the Mobile Menu in another module position as well as opy and paste the Mobile Menu Wrapper Code anywhere in your Joomla template or custom HTML module to display Mobile Menu wherever you need it. You can also display any module in top or bottom of the off canvas menu. The color customizer allows to set the colors of Off - Canvas and Accordion menus as you need it to fit your website. No need to know CSS and edit any files, just pick the colors and save, that’s it! You can add anything to the menu, these can be custom html or any module you’ll find in your Joomla. DJ-Megamenu allows you to display any of Bootstrap or Font Awesome icons in any size depending how it fits your website. Decide where the icons should be displayed desktop/mobile/both. You can use menu notes as subtitles and manage them similar to icons. With special plugin you can edit every menu item right from regular menu edit item view deciding if it’ll be displayed in both desktop and mobile versions, add subtitle, start new column, choose background image, add modules. Every item can also get dedicated access key. 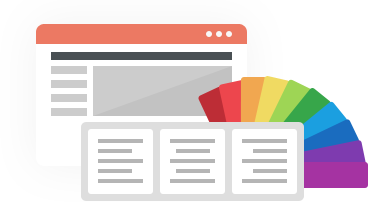 Easily build Mega Menus for your Joomla pages. 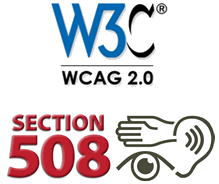 WCAG 2.0 and Section 508 compliant - navigate with keyboard through the menu using Tab key and arrow keys! Free drop down menu for Joomla with animation effects.